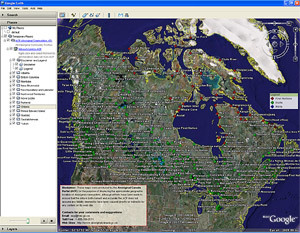 Aboriginal Communities and Friendship Centres in Google Earth is a virtual globe program that is made freely available from the Google Corporation. The program maps the earth by superimposing images obtained from satellite imagery, aerial photography and GIS over a 3D globe. Step 3: Open the Aboriginal Communities and Friendship Centres .kml file and your Google Earth Application with launch with all First Nation, Inuit and Métis communities, as well as the friendship centres, highlighted on the globe. The placemarks will automatically be placed into the "Temporary Places" folder of your Google EarthTM, application. When you close the application you will be prompted to save your temporary places in your "My Places" folder. If you select "Yes" the placemarks will remain on your computer. If you select "No" the Aboriginal placemarks will not be available the next time you start your Google Earth application. The placemark file contains a link back to the ACP server where the information resides. Users can find advanced help on the Google Earth application by visiting the Google Earth Help centre.